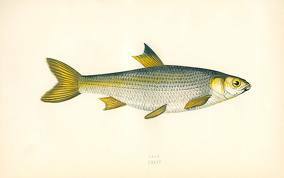 The humble dace is a wonderful river species that inhabits tiny little streams through to huge waterways like the Severn and Wye. It loves fast water, particularly the rapid, shallow and highly oxygenated water immediately downstream of a wierpool. They are quite small fish, in fact the British record currently stands at a mere 1lb 5oz 2dr. An average day fishing for dace will bring fish of around the 3-5oz mark to the net. An angler who catches a 10oz-plus dace ought to feel very proud of himself indeed.